Golden Coast / News & Offers / Sales & Marketing / Blog / Marketing your wet leisure business is only complicated if you make it that way. Like it or not, marketing is a fact of doing business. Some people take to marketing their wet leisure business like a duck to water and some people find it to be something that they are less comfortable with. The thing is, pretty much everyone would like to have more customers and be growing their business and some form of marketing is an essential step to doing that. ‘Marketing’ is the bit that comes before ‘sales’. Before you quote on a pool build, get someone to wet test a spa or draw up the design for a sauna and steam room, there has to have been some form of marketing. In it’s simplest form, marketing is just making sure that someone finds out about your business and that, from what they hear, your business sounds like it can solve a problem for them. Any good salesman will tell you that the secret to making a sale and closing a deal is to listen to your customer, understand what it is that they want and then explain to them how your product fits their needs. Marketing is pretty much the same. It’s just that sales are often done face to face with a person that you can see and hear; marketing is more akin to selling to strangers and doing it at a distance. But it’s all part of the same process; getting work for your business and making the tills ring. One of the most important decisions in getting your marketing really working – and one that people often find the hardest – is deciding what sort of people your business most appeals to. It’s called your ‘target market’ and in an ideal world you want to have that target market pretty closely defined. The reason for that is that it lets you ‘see’ more clearly who your potential customer is and, in that way, you can decide more accurately where and how you might find them and what messages and offers will most appeal. Why is that difficult or hard? Because for lots of businesses, if you ask them who they want to sell to, then they will say, ‘anyone with a few pounds in their pocket’. Defining your target market, and sticking to it, means potentially turning your back on some customers and who likes doing that? But think about it. If you decide that absolutely anyone might buy a pool, spa or sauna from you, how do you market to ‘anyone’? What you end up doing is sending out a broad, general message that is the ‘lowest common denominator’. That sort of marketing isn’t going to get anyone saying, ‘Yes. They really understand what I’m looking for and I’m going to talk to them,’ is it? So you might go about defining your target market by geography – the area that you serve – by the age of your customer, whether they are looking for fun and relaxation or health, how wealthy they might be and so on. 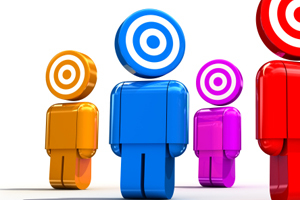 You want to come up with a simple description of your ‘core target market’. That is the ‘person’ that you want to concentrate on attracting to your business. They might be; a fairly wealthy couple whose children have left home, they live in a smart area within 25 miles of our showroom and they are looking for hydrotherapy and health benefits. You might decide that your business should have more than one target market; perhaps you sell spas to young couples as well. That’s OK; just go through the same process for that group as well. Where do we find that ‘someone’? Once you have a target market defined, then it’s easier to see what media or marketing channels are most likely to reach them. Starting with digital media, they are probably using the Internet as a source of information for local activities, for shopping and they may well use Facebook to stay in touch with their family. So your website should be optimised for SEO, you might want to use pay-per-click advertising on the web, you might choose to write a blog that talks about the health benefits of your spas, saunas or pools and puts that in a local context. Or you might go onto Facebook and use their advertising system, which is now highly targetable. ‘They live in a smart area’. You should look at the local press and perhaps consider postcode marketing, which involves sending direct mail to people who are identified by where they live as well as other categories and groups. ‘Within 25 miles’. Are your vehicles and vans smartly liveried? Is your showroom somewhere that gets a high amount of footfall? Are you visible and well known in the area? ‘Looking for hydrotherapy’. You might want to leave leaflets or put up a small poster in local golf clubs, spas or any gyms or health clubs that might appeal to these people. The list could go on. These are just examples, but you can see that by ‘knowing’ the potential customer you can begin to work out ways of how and where to find them. What can you do for that ‘someone’? So you know who they are and how to get a message to them. The question now is, what to say? Again, you have to put the customer first. If we go back to the salesman analogy, then the first thing the good salesman does is listen. OK, you can’t actually listen at this stage, but you can imagine what this ‘someone’ would say and what he or she would ask. Whatever you decide to say about your business, say it because you think that it will be useful or have value to that prospective customer. That’s pretty much a marketing plan built on the back of three simple questions. • What media is most likely to reach them? • What messages will attract their attention and gain their interest? It’s really not that complicated at all.